Something about Holidays always gets me really excited to make the experience great for Pearce. I remember being a child and my parents hiding our baskets and little eggs all over the house for us to find. We would have breakfast, get dressed in cute little dresses and go searching all over the house to find our Easter treats. Easter weekend was nothing short of memories for us. On Thursday night Chris had to work late so it was just Pearce and I. These moments when I get him all to myself for a night are always very enjoyable for me as I have never liked sharing. Pearce was pretty tired from Daycare on Friday, so I made one of his favorite meals – Spaghetti with red sauce. After we both enjoyed dinner we played for a bit then it was time for bath. Pearce has loved playing in the bath the last few weeks – most parents know children go through phases of loving bath time and hating it. Lately we have been playing a new game during bath time, our bathroom has a dimmer so we dim the lights, and I crack open a few glow sticks, the tub is filled with bubbles and I toss the glow sticks in. Once all the glow sticks have been thrown in Pearce digs through the bubbles and finds the glow sticks. After bath we got in our jammies and Chris asked if I could keep Pearce up to see him, So we went downstairs and cuddled on the couch and watched Beauty and the beast, both of us fell asleep before Daddy got home and this moment for me I will cherish for 2 reasons. 1. Pearce has never fallen asleep with me since he was 6 months old. 2. This was my favorite childhood movie and I absolutely love that he enjoys it and we can watch it together like I had with my mom. 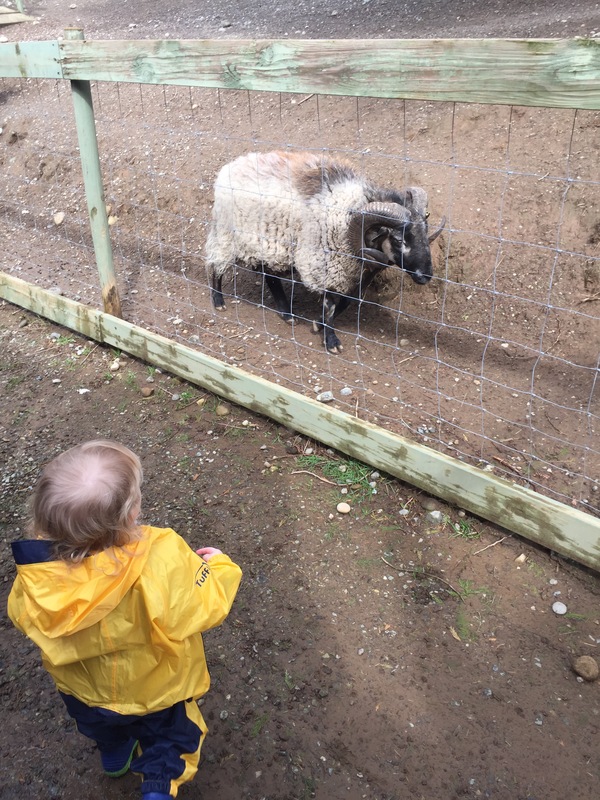 Friday Morning we took Pearce to Maan Farms, it was an amazing time!! 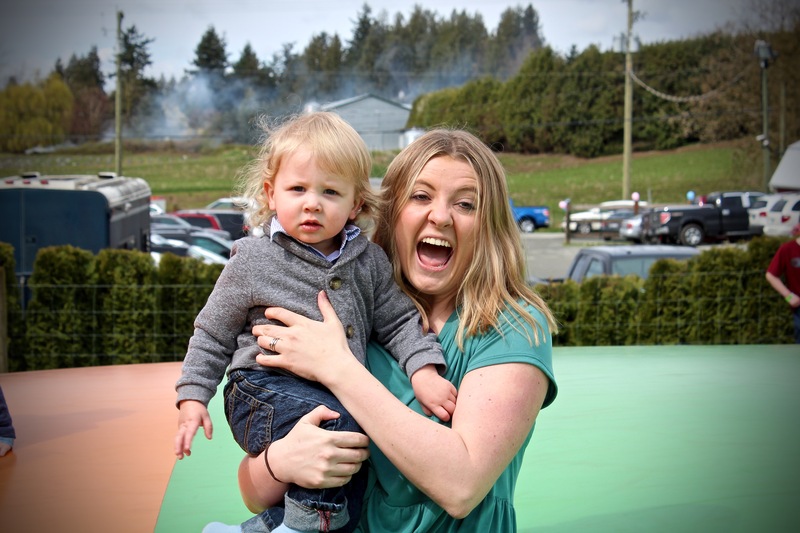 We had our friends the Emersons meet us and my sister Laken and nephew Declan. Maan Farms was an absolute hit! 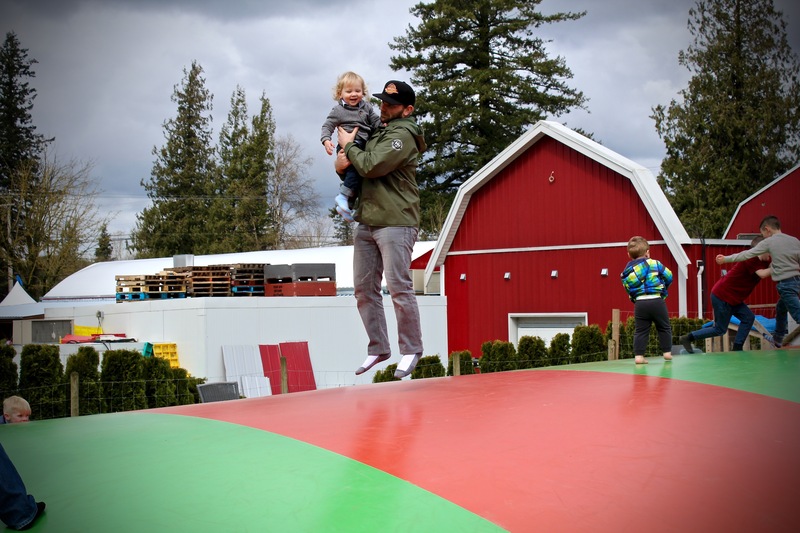 The kids loved it, from the super fast slides, to the petting zoo, the Easter egg hunt, the giant bouncing pillow (I think this was all their favorite), to the pedal car races. 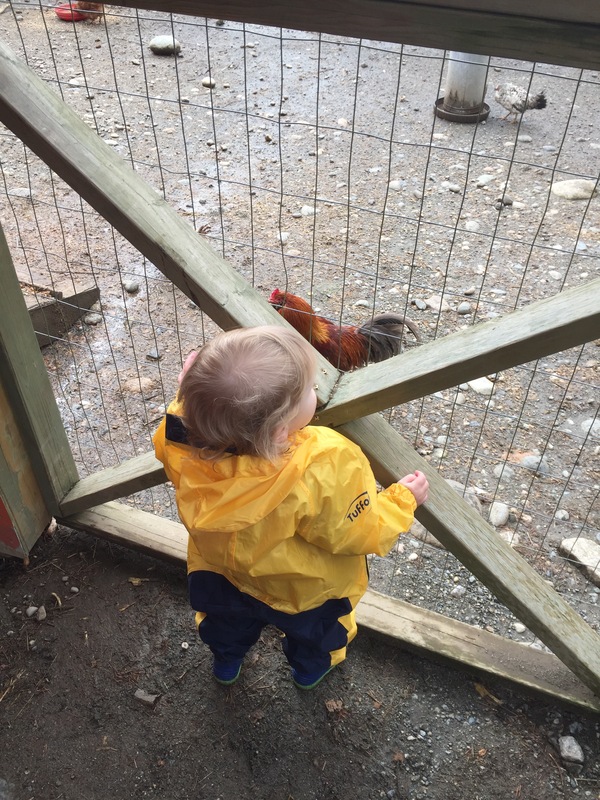 We all had a great time, looking for the golden egg and feeding the goats, Pea absolutely loved the tiny chickens they had in the pen above the rabbits. Maan Farms put together a great Easter Weekend package. They had continuous easter egg hunts going from 11 – 3pm all 4 days. 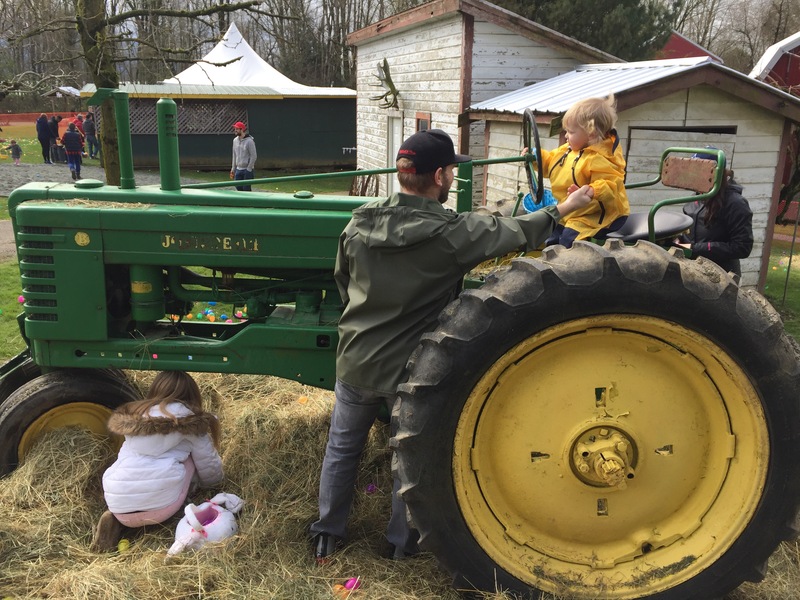 Each child had to find 5 different colored eggs and then they got a bag of candy with a discounted admission pass for their next visit! Watching Pearce experience the farm was a ton of fun! It will definitely be a stop for us again in the future, maybe even a birthday party? After the farm we went for lunch at our favorite pizza place in Abbotsford, Famoso Pizza. Each time we go we like to order a few different flavors and then share them with the crowd. Each time we have been whether they are really busy or steady we always receive amazing service and the food and drinks are delicious. I highly recommend the korean BBQ pizza. Then we got home and mom picked up Pearce for their sleepover and Mommy and Daddy went out for a night on the town. Eating at a great little restaurant downtown called the Union – I recommend trying their wings, street hawker that were amazing! Then off to a concert with friends. Saturday was super mellow, we were all so tired from the busy Friday. Pearce even had a 4 hour nap, too much for that little guy! I ended up staying up really late and finishing 13 reasons why – what an amazing show. For so many reasons I really enjoyed this show, I think this was the first show to really show what highschool can really be like. I mean this in the interactions between kids, the interactions between faculty and kids and the interaction between parents and kids. Some parents have so much love and faith in their children being good people, they stop interacting with their child – to the point where some kids don’t know what their children are capable of. BUT boy does this show end with a TON of questions. Hopefully netflix can take this project on past what the author has been willing to do and create a second season. Sunday was another very busy day, we ended up sleeping in till 9:30!!! Which is pretty amazing in parent life. 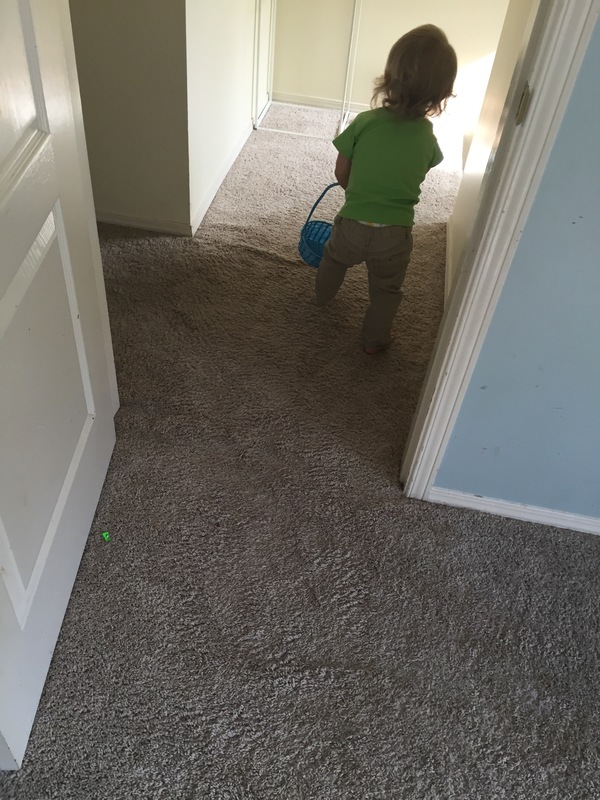 We waited for Daddy to wake up then we took Pearce downstairs for a little Easter Egg hunt around the house leading him to his Easter basket, filled with books, coloring books, a few little toys and play dough. Then it was time to get ready and go meet My husband’s family for lunch. My father in law took the ferry over to meet us for Easter Lunch. So it was My father in law, his wife, her son, my husbands sisters, her husband, my nephew and the three of us! We ended up going to the Tsawwassen mills mall to meet as my father in law forget we only have a 5 seater! So we checked out the Bass Pro shop which we have been wanting to do for a while. Pearce absolutely lovesssssss all the taxidermy animals and the huge fish tank. We even got a free picture with the Easter Bunny, whom gave us a free kids meal to the restaurant Uncle Bucks. After cruising around bass pro shop we went to Uncle Buck’s fish bowl and grill, everyone loved their food mine was sub par and the waitress was strangely uninterested in doing anything extra for me such as making a weak chocolate milk for Pearce, or making any changes to my burger and actually told me to pick off what I didn’t like. I have never had that happen before – it was still a very fun lunch. My husband recommends trying the fish and chips as you get four LARGE pieces which is uncommon. After lunch we said our goodbyes to Chris’s family and stopped at Pearce’s Nonna and Nonnos aka Chris’s good friend Natalino’s parents place we try to stop and see them whenever we are in New West as they are very dear to us and we consider them Pearce’s other grandparents. They spoiled us with chocolates and we got to catch up and see everyone, Pearce was spoilt with chocolate and grapes which he likes more than chocolate. Then it was off to my moms for a nice Easter dinner of delicious Ham, and all the desired fixings. After dinner we played board games with Declan and Pearce and nanna watched storks. After which I was very exhausted and came home to prepare for work. Unlike most other BC residents I had to work the Monday because in my job I actually work for our Alberta part of the company out of our Coquitlam office, therefor i have to take their holidays. Chris and Pearce had a fun day together on Monday and got in some extra bonding time. When I think about the age of which I have really enjoyed Pearce, I think right now is my favorite, he is so fun and adventurous. He loves looking at books and playing in puddles, brushing his teeth and playing in mommy and daddy’s room. This age is so fun and so busy it almost takes away any baby fever I may have. This Easter I think was as fun as it was because of the age that Pearce is, able to participate and still be young enough that I could fill his Easter basket in front of him. 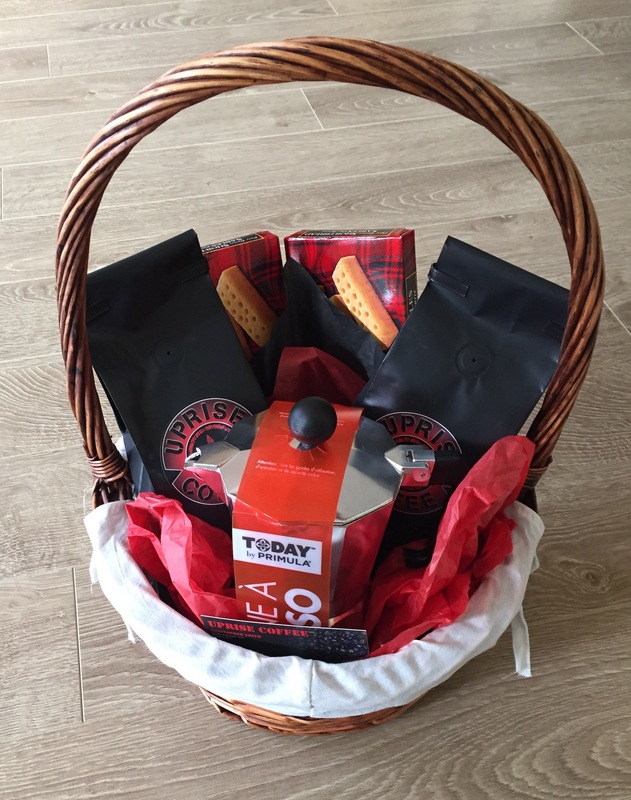 Congratulations Samantha, Please contact chasingmyminimonsterblog@outlook.com to arrange pick up for your basket! thank you to everyone who participated, keep following us for more exclusive offers, and give aways!! Next postThe All Time Low.